I have a new love. His name is Ogleshield. 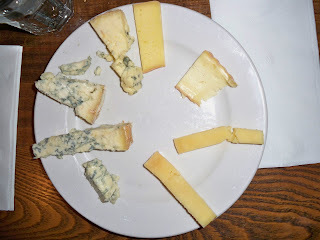 A few weeks ago I went to a seminar given by Dave and Raef from Neal's Yard Dairy,held at Goose Island Brewery here in Chicago. We were given a tasting of eight different cheeses. Today I'm going to talk about the first four. Going clockwise I'm going to start at 12 and tell you about Ogleshield. This was a brand new cheese for me, and I fell in love immediately. From the wonderful people who bring you the big English cheese, Montgomery's Cheddar,Ogleshield is a washed rind cheese. In this case it's been washed in a brine solution. On their website NYD says it's similar to Raclette. I know that they're the experts, but honestly Raclette never tasted this good. It feels like on the timeline of cheese, Raclette evolved into something bigger, better and tastier. It's floral, a bit grassy and beefy. It's got a little bit of a funk going on, but it's very mild. This is one of those cheeses where it smells milder than it tastes. This cheese tastes warm. Not temperature, but when I tasted it I imagined it's melting possibilities. Next up is Ardrahan. another washed rind cheese, this time from County Cork, Ireland. This cheese is also washed in a brine solution, but is very different. Where the Ogleshield has fruity, mellow flavors, the Ardrahan is much more assertive. Bacon, earth, leather and a smidgen of smokiness make this soft but not gooey cheese one of my favorites. The next two are tricksy precious. Why? Because they're the same cheese. This is Montgomery's Cheddar. There are few things in the world I will commit an act of violence for. Cheddar is one of them. Montgomery's is at the top of that list. Keen's, Cabot Clothbound and Beecher's are also on the list. You know when you hear about people going crazy during some W**-Mart Christmas sale? That's me if you get between me and the last hunk of Cheddar. I won't cut you, but you might accidentally "trip". Montgomery's Cheddar is what Cheddar should taste like. Traditionally made it is a huge cheese. Assertive in it's nutty, tangy, earthy, beefy flavors it's like a mini explosion in your mouth. Aged for a few years it develops these nice little crystals through the paste that add depth and a slight crunch. It has a bit of a caramelized, sweet flavor to it. Similar to caramelizing onions. Dave asked us by show of hands which one we liked better. I picked number 2 (#4 on the plate). I was convinced that it was older. Significantly older. Older by at least a year. 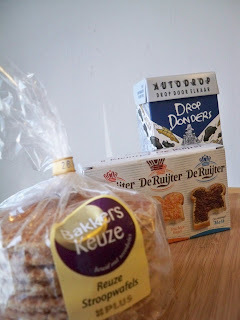 To my surprise I found out these cheeses were made weeks apart, not months or years. So what made the difference? Why did cheese number one taste like a good sharp Cheddar, and the second one tasted like a wild party in my mouth? * Different starters. One cheese was made with a Wednesday starter and one with a Saturday. That, and a few weeks time made all the difference. I always try to get customers to taste the cheese. Sometimes when people come into the shop they say "Oh, I've had _____ cheese before. I don't need to taste it." I try to give them a taste anyway. Usually I'm successful. The Cheddar tasting is an anectode I'm going to use from now on to convince everyone to always taste the cheese. Always. Seriously. 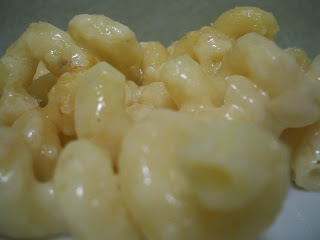 I know it's the middle of summer, but in my opinion macaroni and cheese is a year round dish. My favorite dish in the world is a good macaroni and cheese. I love it so much that if taunted by grade school children I would let them know that I love it so much in face I want to marry it, but current laws in my state don't allow a woman to marry food. Instead of the Taleggio and Pleasant Ridge Resrve, I made this recipe with Ogelshield. For this dish, no mushrooms or roasted garlic are needed. Just stinky cheesy goodness. Warning! Although this cheese doesn't have a big foot on it, when you apply heat to it it makes a powerful smell. A very footy, stinky smell. I'm going to try to do the second half of this post before I leave Tuesday morning. I don't know how much posting will get done during the week. If you're feeling bereft of cheese talk, I will be twittering a bit since it takes less time, and can be done from my phone. Follow me on twitter and see what's going on at Cheesewench's first ACS conference! So, when I was trying to decide where to go on vacation I'd narrowed it down a bit If I stayed in the states it was going to be Oregon or Vermont. 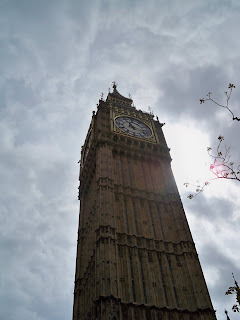 Abroad the choices had been narrowed down to London, and Frankfurt. I was having a hard time choosing. Then it hit me. Neal's Yard Dairy is in London. 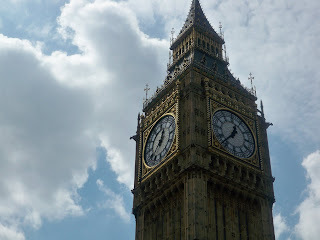 At that is how with one week's notice I flew to London by myself to eat some cheese. I have to give thanks to my cheese buyer and friend Cesar for harassing Jason, Jason, the NYD liaison to the store I work at, and most importantly Lucy who took time out of her day to show me around. Lucy is genuinely nice and perky. She has tons of knowledge, obviously loves her job, is enthusiastic, and I had a great time chatting with her. Oh and Cesar, I'm not giving you Cocoa. You did this out of the goodness of your heart and don't need anything other than my gratitude. This was the first thing I saw when I came into the shop. 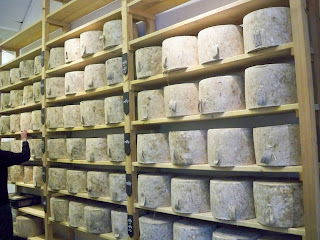 A wall of Montgomery's English Farmhouse Cheddar. This is a phenomenal cheese. A big daddy. A wild cheese. She is big and brash and grassy, and salty. Chewy, milky, fruity, creamy and assertive. This cheese has been made by the Montgomery family for three generations, almost 100 years. About 10-15 wheels are made each day. With such a limited production, I can only advise you that if you are given the opportunity to try the cheese here in the states, please do so. Your tummy will thank you. Here we are in one of the aging rooms. This was my one of my favorite parts of the tour. Ardrahan. Lovely washed rind, stinky, creamy, gooey, lactic, sort of smoked bacony, Irish countryside smelling Ardrahan. 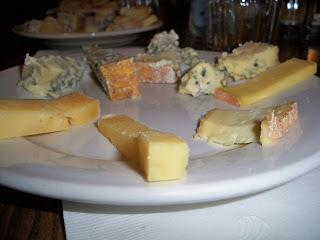 In fact, I got to try all the big stinky Irish cheeses. You all know how I love a stinker, so I was in heaven. Finally tasting all these cheeses was a bit like meeting a celebrity. In the inaugural issue of Culture the word on cheese they did a spread on Irish cheeses, and here I was getting to taste them. 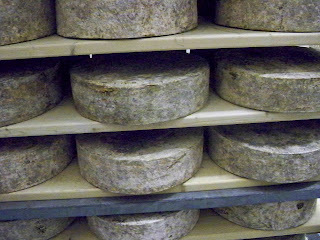 Milleens is the cheese that started the rebirth of Irish cheesemaking back in 1976. It started because Norman and Veronica Steele wanted to preserve some of their milk, then Veronica thought that cheesemaking could be a great idea for the smaller farms. A few cheese experiments later and you have Milleens. The cheese world wouldn't exist without people like the Steeles. Brave experimentation is, in my opinion the heart of the cheese industry. Without it...I shudder to think. The one commonality of all the Irish cheeses I tasted, is grass. 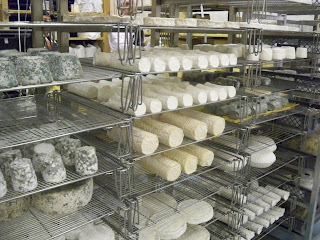 All of these cheeses have an underlying pasture quality to them. I could imagine happy cows munching their hearts out on lush pastures while wafts of sea air swirl in the clover. Romantic? Melodramatic? Sure. But I really could taste that. It made me want to go to Ireland. Seriously. I'm thinking my next trip abroad might have to be Ireland. County Cork. To taste cheese. Mmmmm...Irish cheese. So remember my post about orange cheese? Well, this cheese is the exception to my anti-orange rule. This cheese is Leicester and she is lovely. The best way to describe her is warm. She tasted like warm cheese. Like you'd just made a grilled cheese and were enjoying the molten center. Or perhaps you'd made a casserole and grated some of this on top. I did still get a bit of the red pepper smell, but hardly any of the flavor. This cheese made me happy. Happy enough to buy a smidgen of it and have it for dinner that night. 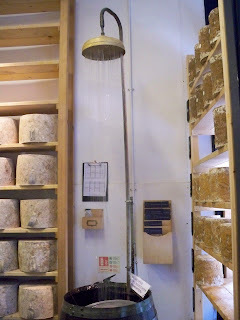 These carts are filled with cheeses for the wholesale fulfillment department of Neal's Yard. Who are the magical cheese people that make up the NYD staff? Well, here are a few. Starting on the left we have Michael Jones, manager of the Borough store. 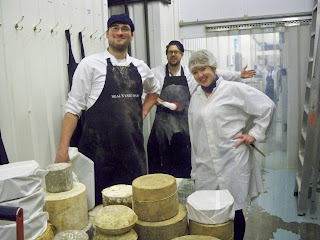 Next up is Martin Tkalez, manager of the Covent Garden shop, and Lucy Moylan, cheesemistress extraordinaire. 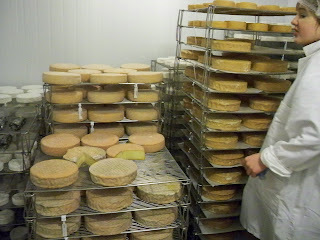 That big pile of cheese is all of the hard cheeses that Michael had picked out for the store from their caves for the Borough shop. He reckoned that it would last a few weeks. I know that the big mound of cheese is cut off, I was laughing too hard to get a good shot of the group and the cheese. Really I was just looking at cute boys because I had turned into a 15 year old giggling schoolgirl for a few minutes that day. I know it may look funny, but Martin is not giving himself a tummy rubble, he's using a brush to clean off the apron. Although, it does make me smile to think of people giving themselves a tummy rubble at the end of the work day. Maybe I'll try it when I leave work today. There will probably be at least one more NYD post coming in the next few days. After all, I've hardly touched on who they are, what they do, and how it translates into being one of the most respected businesses in the cheese world. This is my favorite picture of my whole trip. I have no idea how I got it. I couldn't get a shot this awesome ever again. But man, this is pretty. I think that the photography Gods were just with me that day. The weather Gods also smiled on me during my trip. Only half a day during my trip was overcast, and no rain. Not a drop.